An affordable choice for the sportsman looking for a well-made, dependable spinning reel to take along on his adventures. The Medallion GT has a history of award-winning performance, and the current version continues the traditionwith solid quality from end to end, starting with its all-aluminum body and rotor. The internals ride on a smooth 6-bearing system, the the 5:1 gear ratio provides plenty of torque when you need it most. The drag system engagesseamlessly, due to the PowerLock instant anti-reverse system and its stainless steel one-way roller bearing. "I fish just about everyday in the spring, summer, and fall, and this reel has been through tons of pike, bass, walleye, and a couple salmon. the only bad thong about this reel is its ugly." 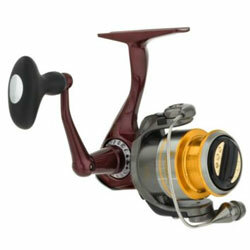 "This reel is well made, and extremely smooth. I've used one for years and it performs as well today as it did when I bought it. Highly recommended."